Overlapping ranges of the four species studied: Tragelaphus eurycerus (blue), Tragelaphus imberbis (red), Tragelaphus spekii (blue) and Tragelaphus angasii (black). TIPE is funded by the AEA and carried out at National Museums Scotland. TIPE will seek to develop biometrical methods for identifying bones of Tragelaphini antelope. This will be accomplished through taking measurements that have already proven successful for differentiating bones of other bovid and cervid species. The measurements will be taken from specimens held by the National Museum of Scotland. Specifically, these are at least six specimens each of Tragelaphus eurycerus, Tragelaphus imberbis, Tragelaphus spekii and Tragelaphus angasii. TIPE will particularly focus on robust elements which typically survive in archaeological assemblages and which have proven successful for differentiating other bovids through these methods, e.g. astragali and metapodials. Bovidae are one of the largest groups of wild mammals in Africa and often make up the largest proportion of mammals on archaeological sites. 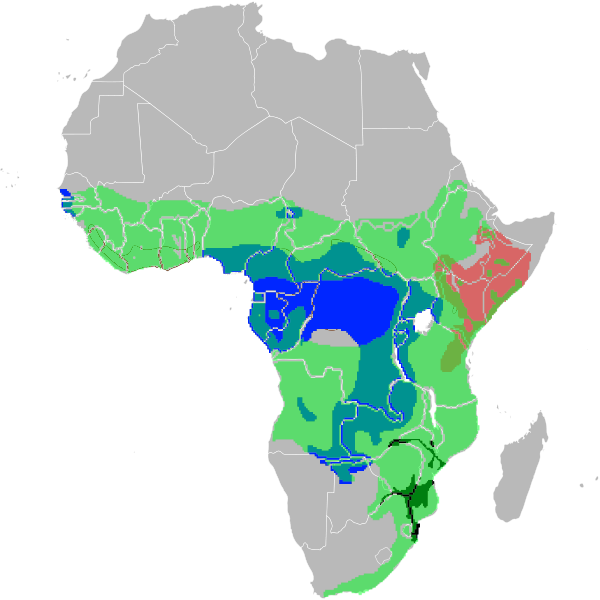 Although identification atlases for African mammal bones do exist and some papers have been published examining the differences between two or three bovid species these typically focus on morphological criteria which can prove extremely difficult to discern in archaeological specimens among such closely related species. Zooarchaeologists working in African often, therefore, carry identification among bovids no further than family level and instead then sub-divide it into size categories. These size categories necessarily include the domestic bovids. At present then, our understanding of wild resource use/hunting strategies, farming strategies and the introduction of domesticates in Africa are all hampered by this problem. Many of these species also have differing life-cycles and occupy different ecological niches, thus our understanding of palaeoecology on the continent and of biogeography are also hindered. Although aDNA analysis has been successfully employed to begin to answer some of these questions in Southern Africa, particularly the arrival of domesticates, the climate across much of the continent is not favourable for the preservation of this type of evidence. Furthermore, aDNA is an expensive technique beyond the budgets of many archaeological projects and especially beyond that of many African museum and university archaeology departments. The development of biometrical criteria for distinguishing these species will mean that all zooarchaeologists working in Africa will be able to employ them successfully and meaningfully with zero extra expense or training. TIPE is envisaged as a pilot project to demonstrate that it is possible to develop low-cost, non-destructive methods for distinguishing African bovids from archaeological and palaeoecological contexts. The Tragelaphini have been chosen not only because of the availability of several specimens from which to take measurements in one location but because the species themselves are of overlapping sizes (weight and height), are highly sexually dimorphic and occupy a range of overlapping territories even though their preferred habitat types are distinct. Successfully speciating these mammals will thus prove that it is possible to speciate such sexually dimorphic bovids even where species range and size overlap.